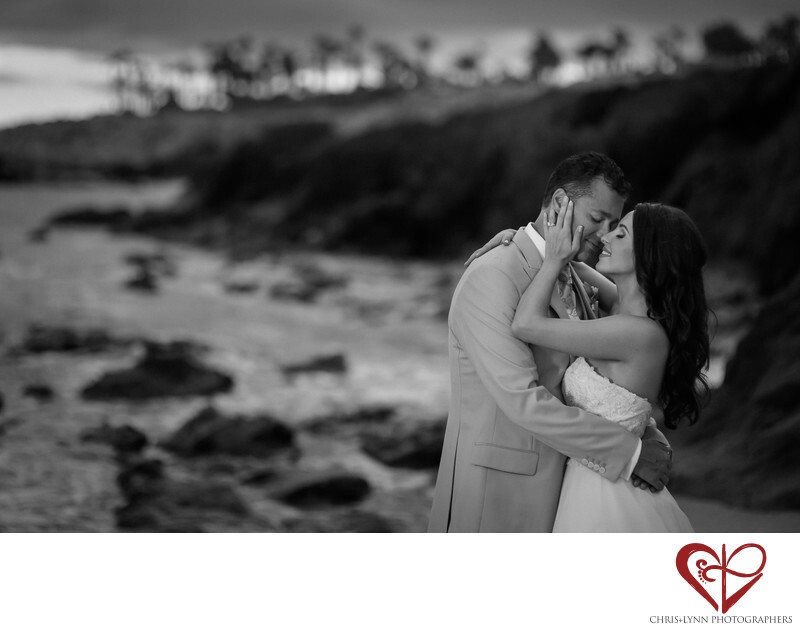 Every time we photograph weddings at Esperanza Resort, we fall in love with it all over again! And especially when we are photographing an amazing couple who are so in love! Esperanza property has one of the most beautiful beaches, made all the more interesting by its rocky shoreline and craggy cliffs. When the sun sets beyond the point, darkness falls fast . Unlike Vancouver or LA, once the sun sets in Cabo, there are only a few minutes of light before it is almost completely black. This couple's day was running later than anticipated after a long, beautiful, and heartfelt ceremony. They only had a few minutes to walk along the beach before the entrance to their reception & the sun had gone down. To light this portrait of the couple, we used a Westcott Ice Light to add just the faintest bit of light to the couple and separate their dark hair from the dark cliff behind them. Our general goals with lighting are for it to be unobtrusive, that it be almost undetectable in the images, and that it create a ambience that looks natural, not artificial. This tender moment between bride and groom would simply not be the same if flashes were popping off or we had to take the time to set up an umbrella. Instead, the romantic portrait remains true to their experience as they took a few twilight moments on the beach to savor the fact they were now married! 1/320; f/1.8; ISO 800; 85.0 mm.